How Well Do You Know PA Driving Laws? While we know you are tested on a daily basis as a driver (both in terms of skill and patience), we thought it would be fun, and hopefully educational, to offer a refresher course in PA driving laws. Take our quiz to see if you are up to date on all the PA driving laws. True or False: Pennsylvania prohibits any use of mobile devices while driving. False. State law prohibits the use of any mobile device for the purpose of text-based communications while driving. This includes text messages, email, apps like Facebook messenger and so on. It does not prohibit talking on the phone or using navigation apps. However, while PA driving laws do not specify that mobile devices must be hands-free, some counties and townships do. Check your locality for more information. What does “Lights On, Wipers On” mean in terms of PA driving laws? Pennsylvania state law requires all drivers to turn on their lights if they are driving in conditions which require continual use of their wiper blades. Read our previous article to learn about possible fines for disobeying this law. How many tiers are there for Driving Under the Influence? There are three tiers based on the blood alcohol level (BAC) of the driver at the time of the arrest. Mandatory fines and punishments are based on which tier the driver falls under and how many previous DUI convictions the driver has on his record. True or False: All convictions of DUI result in a license suspension. False. If a driver has been placed in the first tier, meaning their BAC was between 0.08% and 0.099%, and it is her first offense, the driver’s license is not suspended automatically. However, the driver must pay a $300 fine and must attend an alcohol safety school. While recent legislation has been discussed to increase the punishment for DUI offenders, these do not include first tier, first-time offenders. How much distance must you place between your vehicle and a bicyclist when passing? A driver must give a bicyclist a buffer of at least 4 feet when passing. Drivers may use the opposite lane to achieve this distance, but only if there is no opposing traffic. What should you do if you see an emergency scene ahead? If there is an alternate lane, non-adjacent to the scene, you must pass in that lane. If an alternate lane is not available, you must reduce your speed and pass with as much distance as possible. 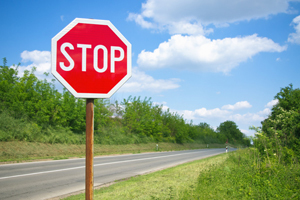 This law, known as the “Steer Clear Law,” applies to traffic stops and disabled vehicles as well.